A few months ago, I upgraded the server that our website Puerquenos.com is hosted on, and I managed to break the server. Of course, I didn’t get around to fixing it until now. Oh yeah, and we stopped traveling around the country and now live in Southern California. After flying from Dallas to Miami for the annual conference in December for my employer, Diio, we drove down to Austin and spent Christmas at my old friend Joe Edgar’s house (they left on Christmas Eve) and then New Years on South Padre Island. We were totally rained out, but then went to Houston, where we replaced the toilet and then back to San Antonio where I flew out to California to see about a job at Hart.com. We parked the RV in Anaheim only a couple miles from Disneyland (and my new office), flew back to Utah and U-Hauled our stuff from storage and rented a house in the Orange Hills. Most Saturday mornings we go to Newport Beach (1/2 hour away) and I can’t count how many times Kelsey’s taken the kids to Disneyland. I don’t know if we’ll stay here long term, but for now, we’re enjoying California. It’s good to be in a house again. As we sit here in super freezing Tucumcari, NM, I realize that today is the 27th, and that means it has been 3 months since we left exotic Orem, UT. I thought since I am awful at updating, I would make a long list of places (in order) we have traveled to (slept at) since then. Do you need a nap? I do. I tried to make this on a map but it broke google maps and mapquest. So maybe I will try harder some other time, but we estimate about 5,000 miles or so. Things are going pretty well. People ask how long are we going to do this, the answer is always “depends on the day”. A few weeks ago I had a mini-meltdown and said I wanted to quit, but the next day I was fine again. Frustrations: No personal/free time, nowhere to put Mikey safely to keep him away from insane 3-year-olds, everything takes longer, everything breaks, etc. But then we have great days where we see new amazing things, or reunite with old old friends and it seems beyond excellent. We will wait until after we get back from Florida to decide what our next destination/plan is. But my question is, how long did you bet we would last? Weeks 2-3: I wrote a detailed post about week 2 that I will publish after I finish the last sentence or two. I got distracted somehow and never completed it. Week 3 I didn’t blog about at all. RVing with 4 kids is beyond a full time job, and I feel like I have no time for anything. And that our RV is still not put in order so it makes it hard to function. Most nights I get into bed like a zombie at 930 after wrestling kids and can’t really do anything. Like blog. Weeks 3-6: Seattle. Our poor RV went to the shop for almost two weeks. The hydraulic pump motor was broken, which meant the slideouts and the leveling system jacks didn’t work. In fact, one got stuck open, so we had to drive from Bellevue to Puyallup (about an hour) with the slideout stuck open 6″. Terrifying. The good news was after pulling teeth to get the repair shop to fix it, it cost only a quarter of what we were expecting. The other good news was we stayed in my dad’s downstairs for free. In almost any other part of the country we would have been paying for a hotel and griping a lot more. We did do a lot of cool things in Seattle. Obviously we saw lots of my family which was great. 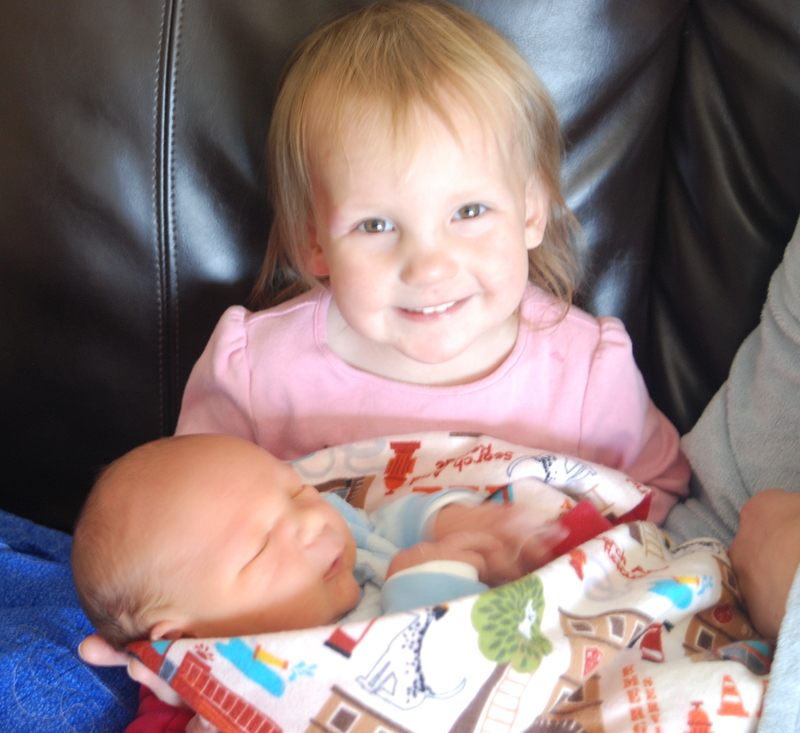 I’m sure we gave them more grandchild/niece & nephew action than needed, so they can easily last until our next visit. We also got to see a few old friends which is also the best. Sightseeing included: The Pacific Science Center & IMAX whale movie, tide pools, horseback riding, Burgermaster, bike riding, playgrounds, riding in Pop’s sports car, boat ride, and Aaron and I even got to go on our awesome customary date to Mediterranean Kitchen. After we got our RV back from the shop we felt so happy to be reunited. It already feels so much like “our home”. This past week on Tuesday we moved our RV out from it’s squeezed spot in my dad’s driveway and brought it to Fall City (out in the country). My mom helped me and the kids drop it off and brought us back to get Aaron in Bellevue later in the day, and when we came back that night there was water spewing out of both sides of the bottom of the RV. Not good. When I set up the systems before leaving, I had set up the water correctly, with the intake set to “city water” which means just like it sounds, the RV runs the water from the hose when I turn on a faucet inside. Instead the RV had decided to fill the water tank, so the water was coming out of the water tank overflow and also the hose where it was entering on the other side. Fantastic. We already knew that our water pump was on the fritz, but were not expecting this. Luckily everything inside was dry and fine. But we are already sick of fixing things… We spent an hour or more trying to get things fixed. Eventually we had to settle on turning the city water hose off and just running from the tank. After research Aaron found that a broken water pump could be causing that to happen, along with the other problems we have been having with it. Fantastic. Did I say that 200 times yet? Did you feel the sarcasm? Good. We ordered a new water pump and Aaron hopes to find time to install it Saturday. Let me stop here and interject with a life lesson for you: If you don’t have a lot of time and/or aren’t handy and/or aren’t mass rich, don’t buy an old RV. Or a new one. It seems that we are having thing after thing break on our 12 year old RV (which only had 66,000 miles when we bought it). Which leads me to my next story. Soonish after we started our trip, we noticed that our batteries weren’t holding their charge. We knew that there were some issues from our test trip and messing around in our driveway, but we now knew that both the RV “house” batteries (they run lights, water pump, and ??? mysterious things that drain it?) and the engine battery were draining at an accelerated rate. They should in theory charge when you run the engine, which they do, but they don’t hold that charge as long as they should. Also when we are plugged into 50 amp power (at an RV park) it should both charge all of those batteries, and not drain them. But they drain. On 50 amp power. Still quickly. So that is a bust, because Aaron has almost zero time to figure out what is going on, and also he is not an electrician. This morning I checked the batteries (there is a little button on the control panel in the hallway) and they were the lowest ever. We hurried to turn on the engine to try to charge them, but it was too late. Dead battery. Already too long story slightly shorter: we plugged the battery jumper into the power (ON THE RV) and charged it up until it was able to jump start the RV which then ran for a while and charged the batteries. FAN-TAS-TIC! Another whole system that doesn’t really work well. Kelsey: I love being on the road. I love seeing new places, going on adventures. I don’t love the endlessness feeling of never really having our stuff put away yet. This was exacerbated by the fact we had to pull almost everything out of the RV (and all over my dad’s downstairs) when it went to the shop. Just tonight we brought the last load of it from my dad’s and there is stuff EVERYWHERE. That part is really stressful. It is hard to put away while taking care of and homeschooling 4 kids. The other part I dislike is I feel like I have no time for anything. When we lived in a “sticks and bricks” house, things were already in their places (ha ha, right, there was just more room to spread it out) so I could do things like sew and leave it where it was. Now to sew (or do anything, eat, sleep, school, toys) it requires getting stuff out, setting it up, doing it, taking it down, putting it away, every time. 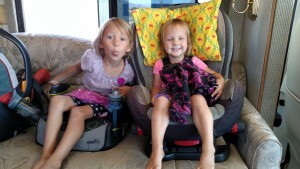 I thought life was going to be a little bit simpler in the RV but so far it doesn’t feel that way. But on the whole I am liking it so far. There is a trade off in everything, so really aside from the RV that wants to break in every way, I am pretty happy. (Kelsey’s assessment of) Aaron: It is ok. He is not in love with it. This is primarily because he still has a full time job that he works 40-50 hours at a week. It is not fun to see your family go hiking at Crater Lake or go to the tide pools when you have to stare at a computer screen. Also his work station is not very efficient. He has back problems, and needs a standup desk for part of the day, which he has built in a closet, but it is not wide enough, and not working great. In my opinion this will continue to be a problem and will quite possibly put a huge damper on the trip if we can’t figure something better out. 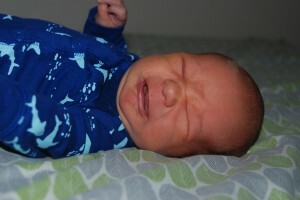 He is also not pleased with the multiple things wrong with our RV. I will give him immense credit and thanks for building a super sturdy table bunk situation which I promise to photograph soon. Also, for the record, he is a real sport about things and says he wants to keep going. Harmon: Legitimately misses his friends in Utah, which is both sweet and sad. Enjoys all the outings we are doing, loves school except for handwriting. I think he is having a pretty awesome time, but really does miss his friends. Sammy: Loves it. Was probably the happiest to be reunited with the RV after it’s extended stay in the shop. Loves being so (physically) close to her family at all times. She really loves exploring and loved visiting family. She claims she can’t wait to be “on the road for real” again. Allison: Loves everything. Except when she doesn’t. She is two. I think she is enjoying it. Except that she can’t always do everything Harmon and Sammy do. Being 2 is rough. 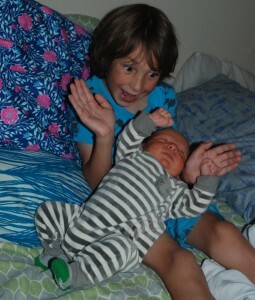 Mikey: Best baby ever. Happy, army crawling, rolling like a maniac, two teeth on bottom, 3 broken through on top (within the last week) with a 4th coming in the next day or two. Not as good at sleeping as he used to be, but with those teeth I can’t really say I blame him. Smiles at everyone, best smiley eyes. Did I mention best baby ever? For reals. That was way too long. Questions? Comments? Concerns? Free driveways?? We quickly decided we needed to do more than just camp in our driveway. We needed to try out all the things, so last Saturday we loaded it up with water, bedding, and gas and took off. That makes it sound so simple, but what that really entailed was several hours of prep, mostly spent filling up the water tank, draining it, filling it up again, and figuring out how to prime the water pump. Eventually we were underway. 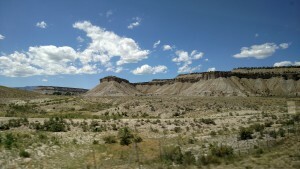 Aaron had decided upon Price, UT which is about an hour and a half Southeast from Orem. He picked this mostly based on the fact that it was close to home (something goes awry we can always drive back) but far enough that we have to keep the engine running for a while, drive windy roads, and to not be tempted to just come home because it is so close. The girls enjoying riding sideways. Harmon feeling luxurious in the passenger seat. Some cool views out the windows. We stopped for a late lunch in Price at The Greek Streak. We all highly recommend it, especially the chicken sandwich & tzatziki. The kids thought the grilled cheese pitas were amazing as well. 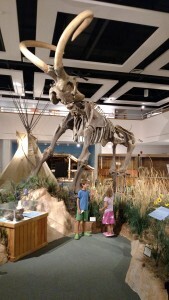 After lunch we hit the USU Eastern Prehistoric Museum. A good museum and well worth the stop if you are nearby. 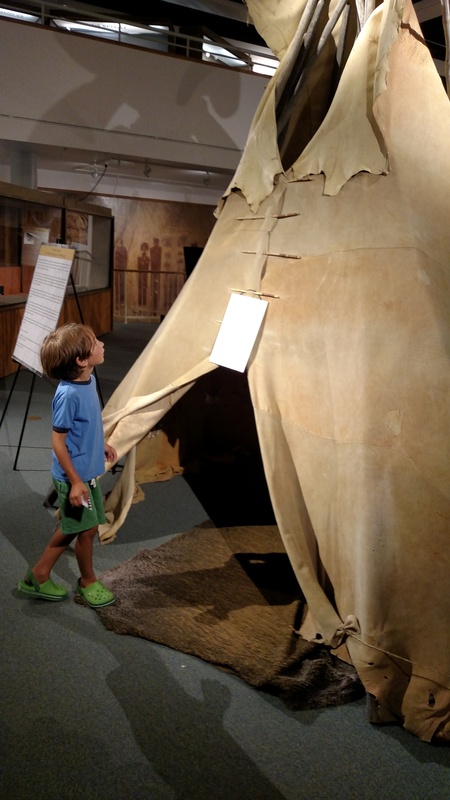 One half is dedicated to native people and features awesome displays of arrowheads, shoes, pottery, baskets, and the like, and the other half to dinosaurs. The museum has a great kids area, complete with a sand pit where you can dig up bones, puzzles, puppets, and more! 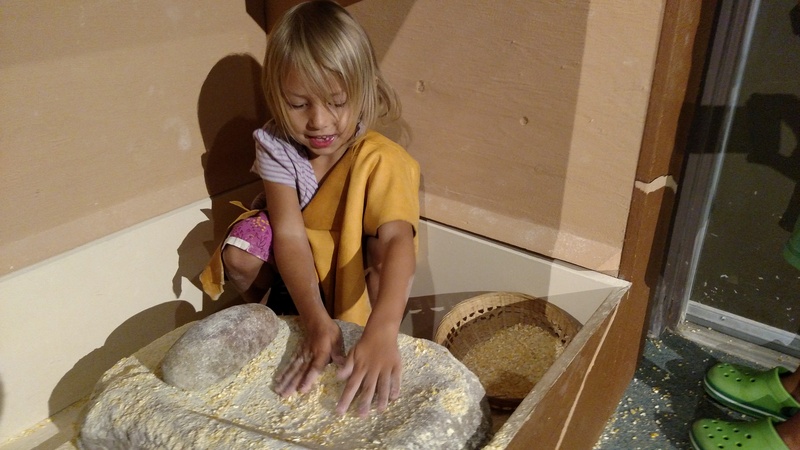 Sammy grinding corn into meal in her traditional apparel. 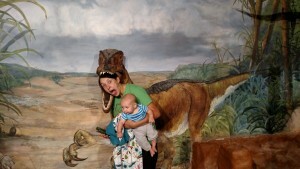 Kelsey getting eaten by a dino. Mikey is not too worried. 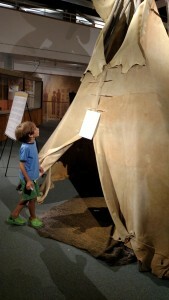 Harmon checking out a teepee. After the museum we went to the grocery store to pick up some food for dinner and breakfast. 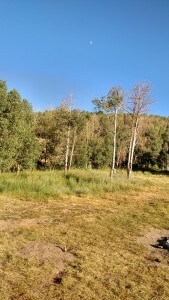 Aaron had several options of where to camp for the night, a few RV parks and a few state campgrounds. 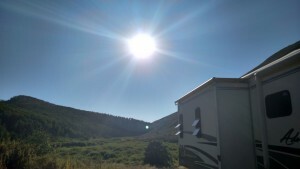 We decided to skip RV parks (we mostly wanted to go there to practice) because we will get plenty of practice when we leave at the end of the month. Our #1 desire was to boondock (also known as dry camping/free camping/not being hooked up to anything) so we could see how everything performed. 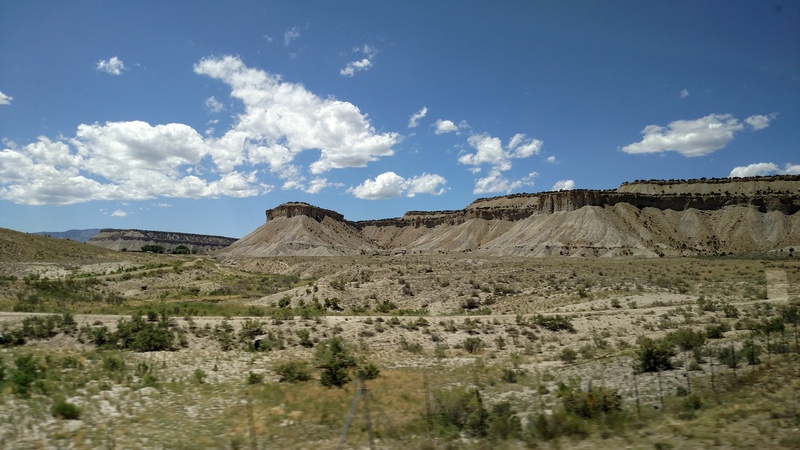 Instead of going farther South into the desert we decided to head back part way towards home to a national forest that had two campgrounds and a potential area for boondocking. We drove to Scofield State Park. 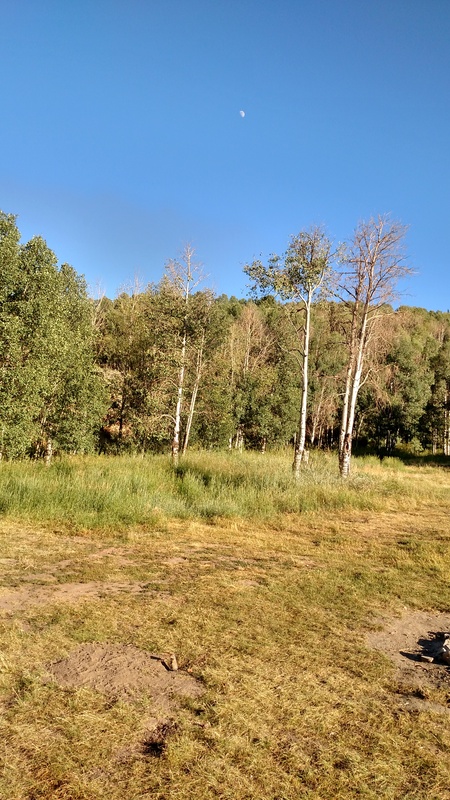 The campgrounds looked fine, but we continued on around the South side of the reservoir and stopped at a little gas station to get matches and paper towels. 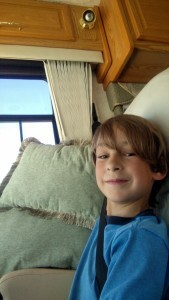 Aaron asked the owner if he knew anywhere to boondock with a giant RV, and happily he told us about a great area nearby. We drove up a nice dirt road which was barely big enough for our beast, and luckily not too steep. After a bit we found a nice clearing on a little side road that had two fire rings and no humans. Sold! We parked, leveled our rig, and set up for the night. The spot was close to a creek, so Aaron and the bigger kids went down to swim by the beaver dam. We saw a pair of deer, and lots of prairie dogs which are probably the cutest animal ever. It got cold, because we were in the mountains (instead of the desert we intended to be in) but we had a nice fire and put on the few layers we did bring. At night we were cozy until about 4am. 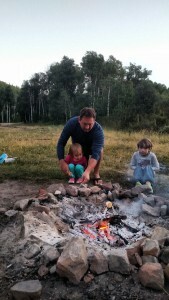 At 4am it got too cold for the kids so Aaron fired up the heat for the first time. Blessedly it worked and everyone was able to go back to sleep warm and happy. 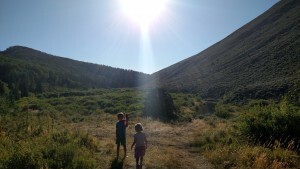 The next morning we got up, ate a (disgusting) breakfast of pop tarts, and were on our way. Even made it home in time for church! A very successful and fun first trip! Ah, a lovely slide out in the sun. Back that way is a the beaver dam and creek. 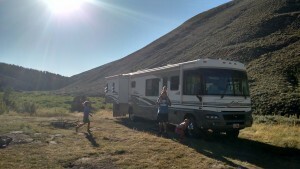 I love pics of the RV sideways with the kids next to it. It makes it look especially huge. and Sammy doing who knows what. It was a bit chilly, but we survived. 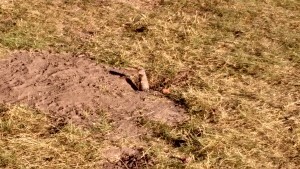 Tiny prairie dog and the moon. 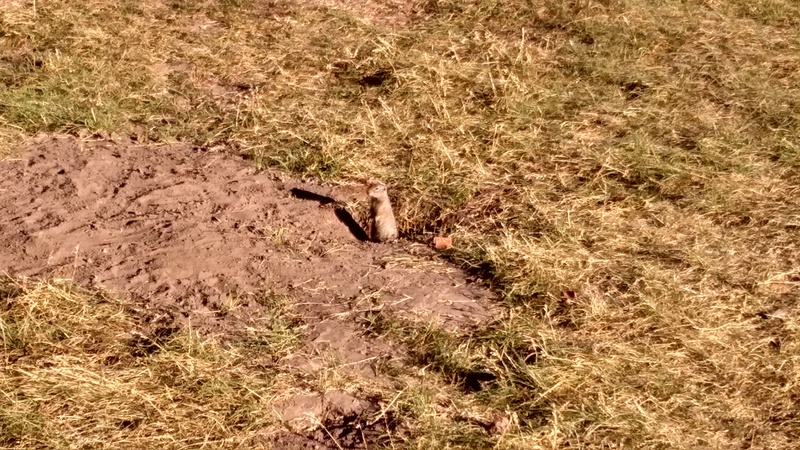 Seriously, why are prairie dogs adorable and rats/mice not? Harmon & Sammy walking towards the creek path. Sadly no pictures of nasty pop tarts were taken. The end. Alternately titled: Just kill me now. While we were waiting to get our RV (the previous owners were having the windshield replaced) the kids could hardly contain their excitement. Maybe the grownups too. In our pre-receiving joy, we promised the kids we could sleep in the RV the very first night we got it! What could be more fun? Yay!!! Well, as it turns out, lots of things. 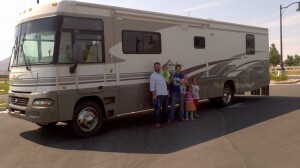 We picked up the RV in the afternoon on the 3rd of July. For any of you not living in Utah, you will note that fireworks are permitted from the beginning of July, and people don’t take that lightly. So many fireworks. For hours. For days. I knew this would be a problem for sleeping in the RV that night, but figured we could survive. All in all a successful first night. No one died, we all stayed in the RV all night, and everyone was happy in the morning! 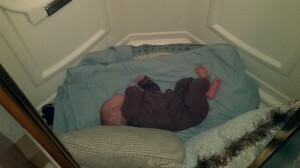 Baby Mikey enjoying his sweet pillow and blanket bed in the shower. He probably slept the best out of everyone. Buying an RV is hard. Sort of. Almost 4 weeks ago we decided that we were going to get an RV and live in it. All around the country. That part was pretty easy. Scary, insane, but easy. Then we started looking. And looking. We set a budget, and knew that we needed something big, because we have lots of humans. But that was about it. 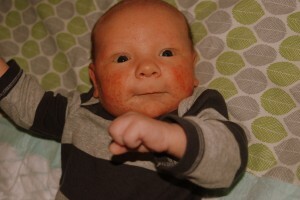 Aaron spent tons of time the first week reading reviews about “Diesel Pushers” (More powerful! Last forever!) vs. “Class A Gas” (Less expensive price! Less expensive fuel! Less expensive repairs!) 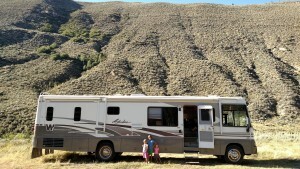 RVs, and even came across something we didn’t realize existed, RVs with bunks! 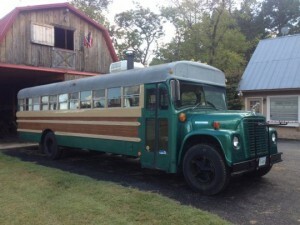 We even toyed with the idea of getting an old bus and renovating it to our liking. We stayed up until the wee hours of the morning the first week (at least) talking about RVs, looking at RVs online, reading about RVs, drawing custom bus plans, etc. Many times Aaron would joke that we should just hurry up and buy something so we could get some sleep. The first motorhome we looked at (and spoiler alert: the one we ended up buying two weeks later after seeing what felt like one million other ones) was being sold by a nice couple 25 minutes from our house. We went and looked at it and really liked it. It was 12 years old but in amazing shape, and as they were the second owners we assume that neither owner used it very much, and when it was not in use it probably sat inside a garage. Plus the price was good, especially for what it was. The main drawback from the start was how would we all sleep comfortably? Aaron and I each had a list of the most important things we were looking for in an RV. I don’t remember his list (maybe when he comes home from getting sparklers I will ask…) but my top three were reliability, comfort of sleeping, and easiness of driving/safety. 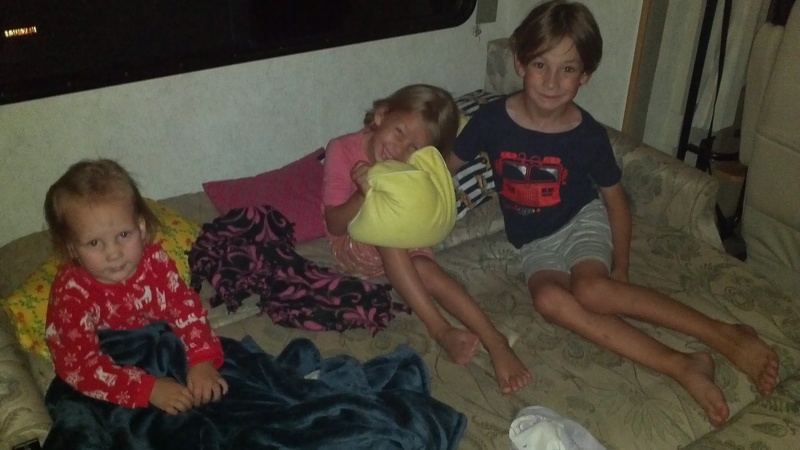 To choose to live in an RV fulltime I really felt that the kids needed comfy places for sleeping, because if they sleep terrible, I sleep terrible, and then I am super cranky. 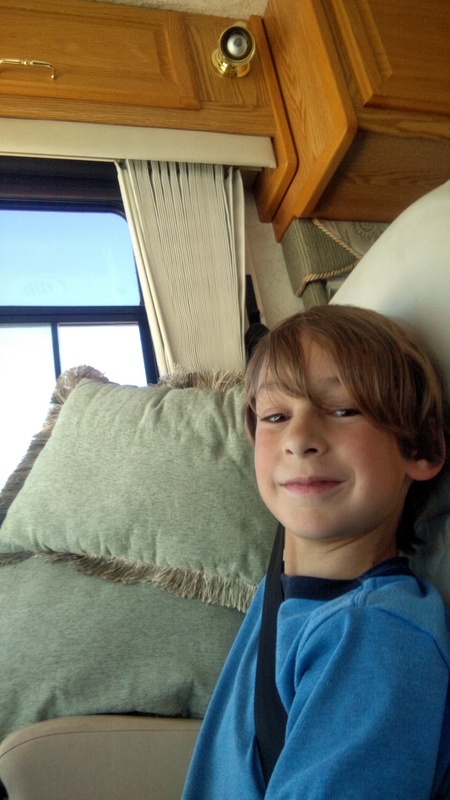 (That will surprise exactly zero of you who know me at all…) This first RV had a queen bed in the back, and a jackknife couch in the front (cushions pull down to be the bed, not a pullout couch) but no bed at the table like in many RVs because the table has real chairs at it. We had already seen pictures of RVs with bunks and considered that we would probably have to modify to put in bunks where the table was if it was going to work. So we went to look at more RVs. We spent the next two Saturdays and a few weekday afternoons as well at several RV dealerships that had RVs we were interested in. We saw some we like fine, and one we LOVED. So just get it, right? Wrong. There is apparently a type of motorhome called a Super C. Class C motorhomes are the kind with the overhang over the cab, and we (Aaron, because he is the researcher) had already decided we wanted a Class A (big huge front windows, no overhang up top) because of power of the engine reasons. (Something about what kind of frame it is built on too, or something? You can ask Aaron if you care about stuff like that. You can tell that I maybe don’t…) The Super C has an overhang with a bed up top, but a more powerful engine. A few models even have bunks. One we found had bunks and the cool bed over the top and lots of space. We for sure loved it. Except the price tag. So we (semi-responsibly) walked away from the first Super C. But we couldn’t put it out of our mind. We later heard that one sold the next day, something about people in Utah having a lot of kids and needing bunks to sleep them all in or something… We had a hard time getting the Super C out of our minds, and went to look at one more even though it was well beyond the limit we had originally set for ourselves. A second time we were sort of responsible and walked away. Outside of the two Super Cs, no other RV had impressed us more than the first one we saw. Plus the price was better because it was a private seller instead of a dealer. And also most of the dealers made us want to die because they were the worst. Yesterday, after almost another two weeks the owner calls to tell us she is back from vacation and the windshield would be ready that afternoon! As an added bonus, even though it was the 3rd of July and many places were closed for 4th of July observance, the credit union where she had her loan (and we got ours) was open! We met later in the afternoon, did all the paperwork, and got the keys! I convinced Aaron to let me drive it home, so I strapped the three big kids in and drove home. Aaron followed me in the car with the baby. 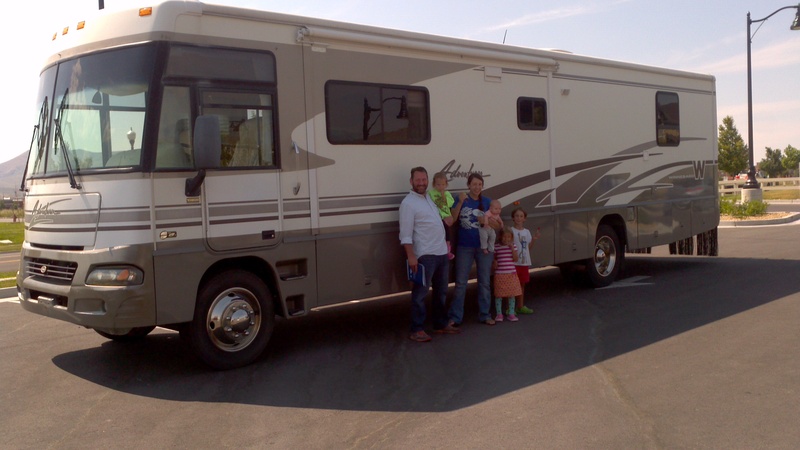 And now we are the proud owners of giant RV. I would say that I am the worst mother, but I have seen a few that are worse than me, so I will withhold that title for now. 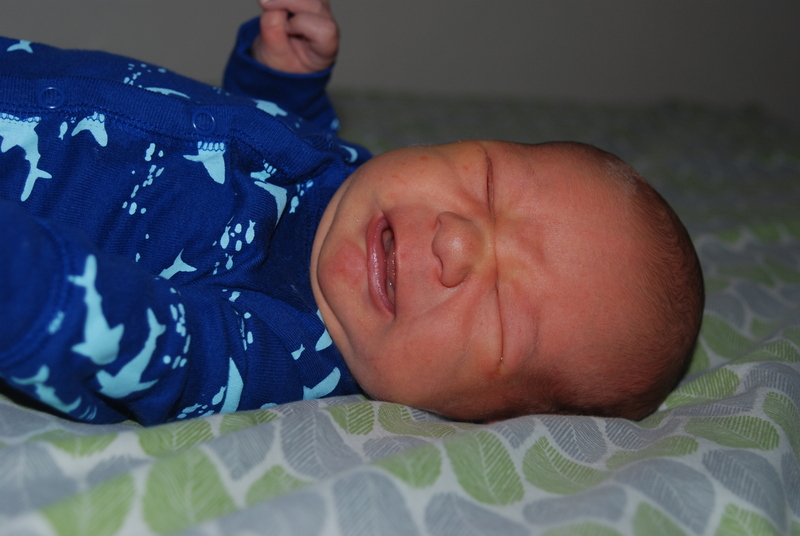 But I am the worst blogger, and didn’t even update my blog a month ago when I produced a new child… Oops. 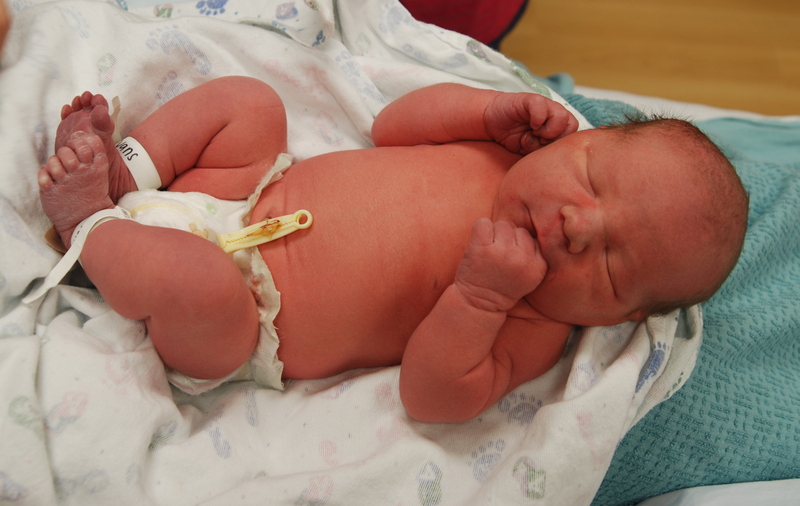 So, without further ado, I present BABY MIKEY!!! Michael James David Evans (do you need a nap?) 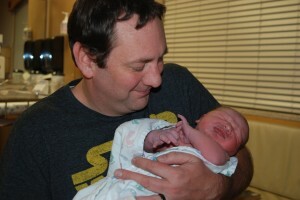 was born on 4/3 a bit after 1am. Weighing in at an impressive 9lbs 12 oz, 21 and change inches in length, and a 38cm head (100% people!!) 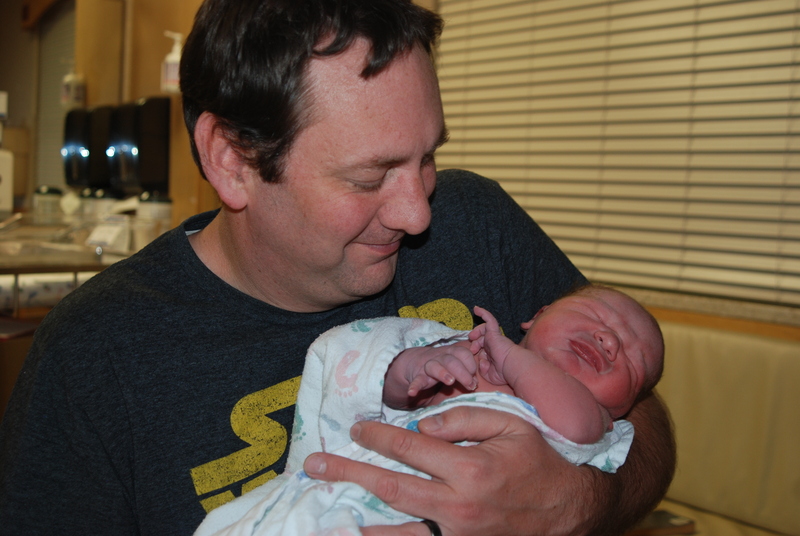 Someday his mother might write his birth story, but that day is still not today. Baby Mikey is loved by all, excessively much by some. (I’m looking at you, Allison!) 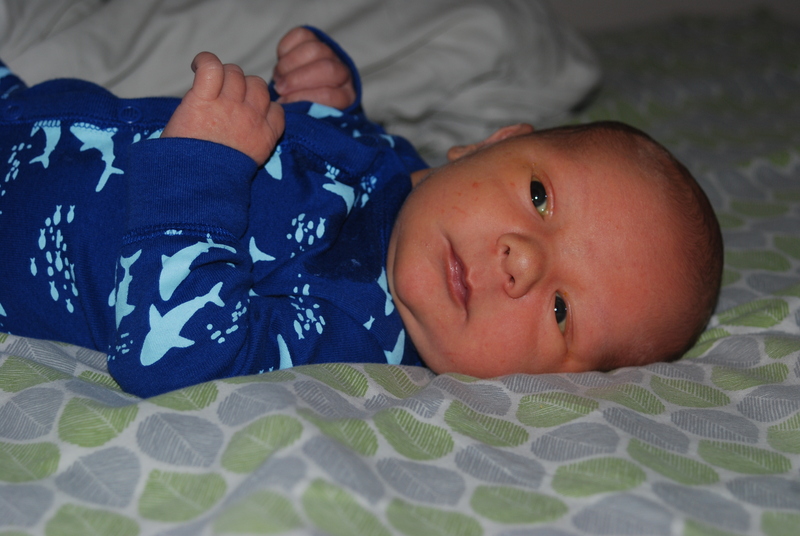 He is pretty much the world’s best baby, and I won’t write too much about his great qualities because I don’t want to jinx life, but I will say that at one month he is smiling on purpose a little bit and is stinking cute and wonderful. 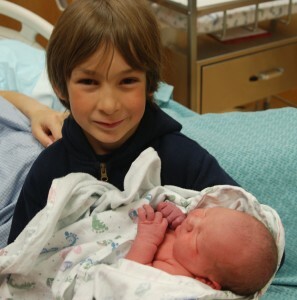 Once upon a time, Mikey was born. Then we all took turns holding him. Daddy first. Then Mikey came home. And we held him some more. Mostly Mommy. And Harmon. But maybe he needs some help. 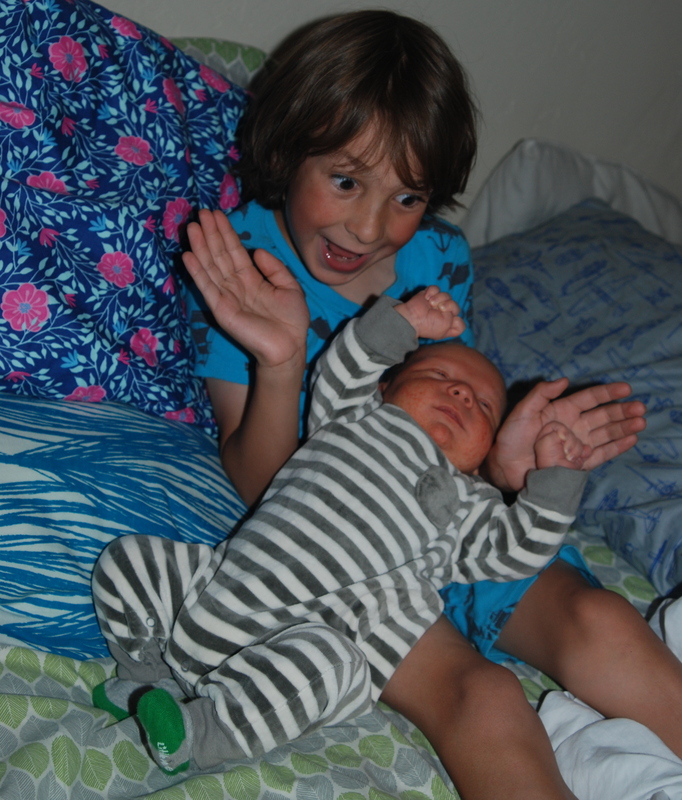 Sometimes Baby Mikey was awake. 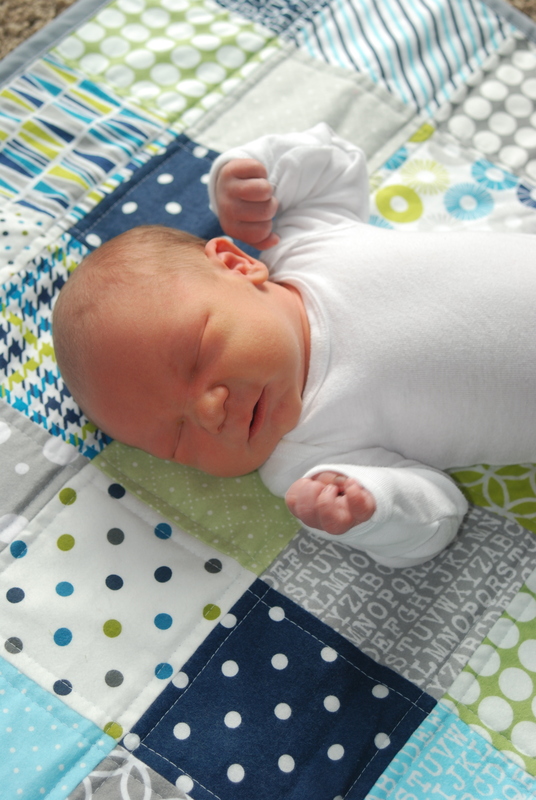 Sometimes his mom laid him on quilts and he rested. 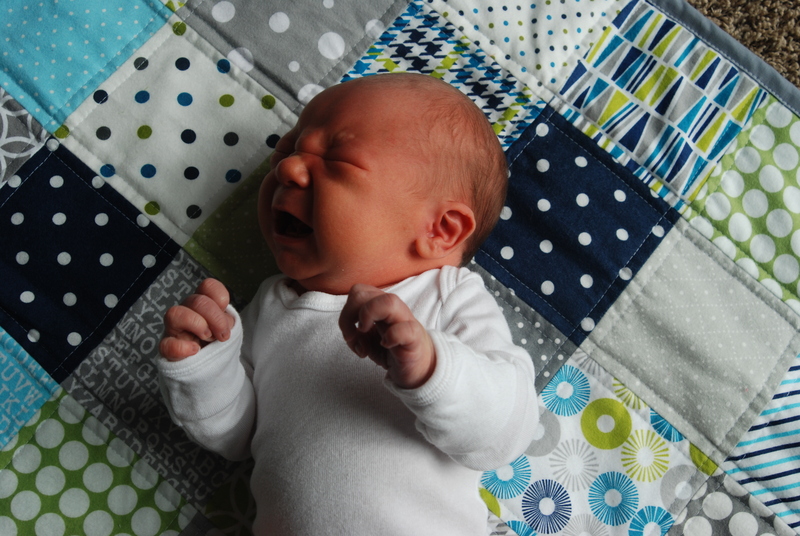 But sometimes he got tired of hearing about his mom’s quilts and he cried. 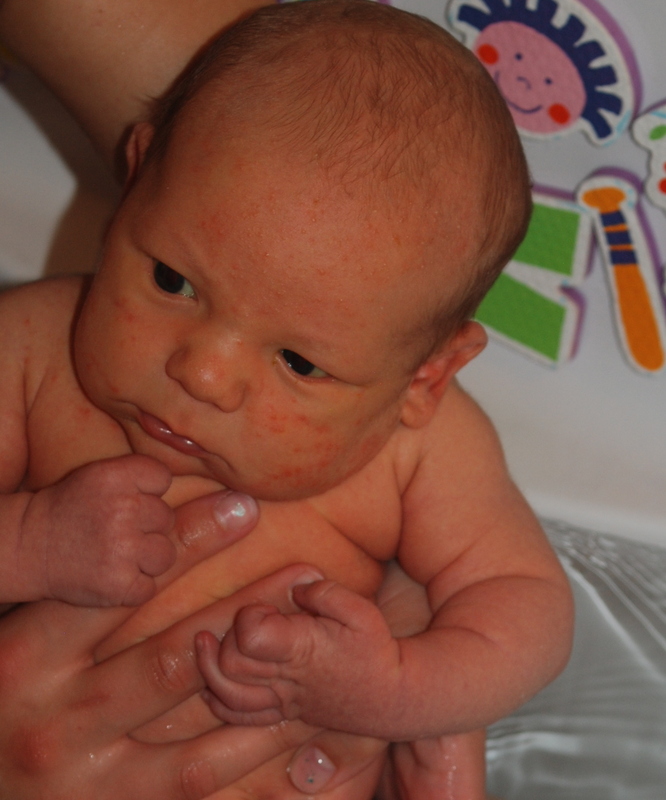 He was pretty sure he liked baths. And although he didn’t love his baby acne, he was so happy and so was his mom who almost caught him smiling. 2014 was a pretty good year for all of us. We all survived, and still like each other, so I am going to count it as a win. Aaron: This year Aaron did the unthinkable and stayed at his job for over a year. As of right now he is at almost 1.5 years, and his wife has demanded he remain there until she has her baby because it has excellent benefits. Like paying him dollars and such. For Christmas he received a smoker from Santa and a cool book on curing and smoking meats and looks forward to opening his own fancy salami and other cured meats shop shortly. He was happy to build the largest snowman in the neighborhood after the first major snow, putting all other neighborhood dads to shame. Aaron’s other major accomplishment this year was reaching 2.5 years of living in the same place, which is the longest he has lived anywhere ever!!! Kelsey: This year Kelsey did what she seems to have been doing continuously for the past almost 7 years. 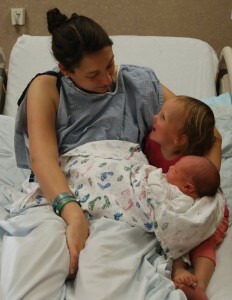 That’s right, growing yet another human and complaining about how horrible it is and how stupid she was to do it again. She really is grateful but is not good at expressing that sentiment. Kelsey read probably 2 or 3 books and 2 or 3 magazines so she considers it a pretty productive year. 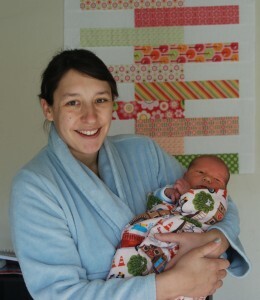 Oh, she maybe made some quilts too. Kelsey’s 2015 resolutions include having a baby and never getting pregnant again. And also keeping everyone alive. Harmon: In October Harmon managed to turn 6, despite his wishes from age 2 on to never get older. He seems to be taking it in stride, as birthdays seem to yield more precious legos than he can afford from his day job earnings. Harmon has started Kindergarten at the closest school we could find, our house. He loves it, and so does his teacher and classmates. When not building/fixing/thinking about/watching or creating reviews about legos, Harmon enjoys playing outside for hours (heat or snow) and playing all sorts of games with Sammy. While you shouldn’t brag, this is my blog (and I will do as I please! ), so I will add that Harmon is ridiculously smart, sweet, sensitive, and we love him to death. Sammy: In December Sammy reached the ripe old age of 5. Sammy has an infectious smile that saves her from trouble on many occasions. Sammy loves art of any kind and can be found doing projects for hours on end. One of her favorite activities besides drawing includes cutting paper into teeny tiny pieces. I think it goes without saying this is not her mother’s favorite activity. Sammy is a great big sister and is constantly playing with/tormenting Allison. Sammy is also known for her fierceness, both against members of her family, but also in defending her older brother from “rude kids” in play areas at fast food restaurants. She is awesome and we likewise adore her bright personality and love her to death. Allison: If there was ever a better age than 2 I wouldn’t believe it. Allison (who coincidentally turned 2 in November) is a wild maniac who enjoys doing somersaults off the couch, running through the house in her underwear, and destroying whatever her siblings build. She also enjoys keeping up with the chatterboxes in the house, both in amount of words uttered and decibel level. 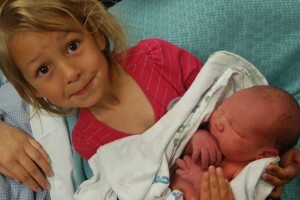 Allison’s favorite thing is Michelangelo the ninja turtle, whom she affectionately calls MikeyAngelo. Allison loves reading books, going outside for walks with her daddy, playing stuffed animals with Sammy, and trying to get in the middle of whatever Harmon is doing. She is a good eater, and we hope someday the older kids will learn from her. Allison is super charming and keeps us laughing. I think it goes without saying that we love her to death. 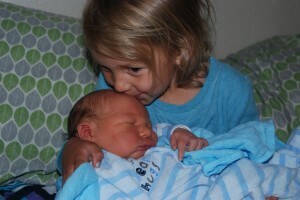 Baby #4: He is a boy. His hobbies include having the hiccups and making his mother cry with pain while expanding her rib cage with a vice. Luckily he has funny heels that tickle and if he doesn’t stay in too long he may be forgiven. He should appear in the end of March, but his mother suspects he will wait until April 1st because that is just funnier. We are blessed. The End.